Well, three months later and numerous hours of frusteration (mainly getting my hands on the materials!!!) 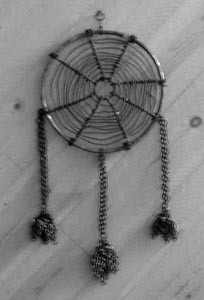 its finally done! about 60lbs of stainless steel, including the hand forged/fabricated frame. The dimensions are about 3' wide, 2.5' deep, 18" high in the front and about 3' in the back. This chair is so sturdy i can stand on it (see pic below). Later on i might try to deepen the seat--thats my only complaint. The fabric on the back, sides and from is 3-1 oriental with 7/32 links. 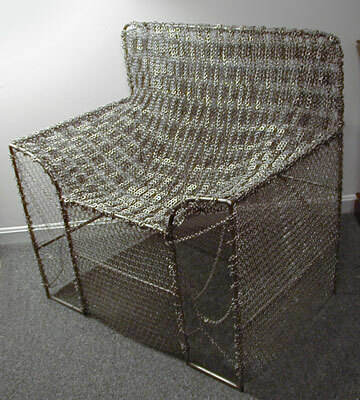 The seat itself is washers mixed with some brazed links and some butted 14guage links. Whew...fun! Left picture: me hoping on the chair. 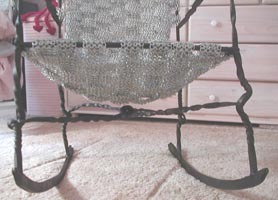 Right picture: detail of seat. 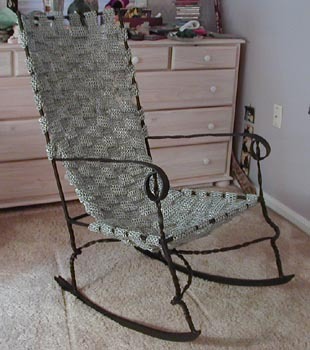 This chair took over 1/2 mile of wire to make! The chainmaille part of this was done with 14ga 5/16"id rings that were knitted into strips then woven throughout the frame. As of now, it has held over 200lbs without a problem. The ironwork done with this is detailed a bit more below with the picture. 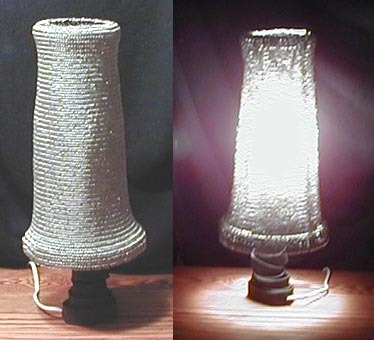 This lamp shade is made from mostly 5/32"id, 17ga stainless steel rings. The shade itself weighs 3 or 4lbs. The lamp frame itself was hot forged (pic below). This took about 1 month of hours a day of work to complete. This candle holder was made mostly from 1/4" stock, except the stem, that was made from 1/2" stock. 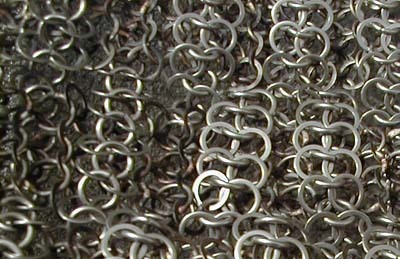 The maille covering it is 5/16id". This table is another thing i had been pondering for a while. 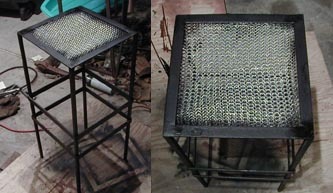 The top measures 12" x 12" and is held on by welds on the bottom of the iron. It is 5/16"id 14 ga rings.